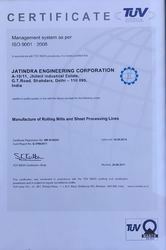 At Jatindra Engineering Corporation, we have been engaged in manufacturing and exporting a wide variety of precision engineered Rolling Mills, Sheet Processing Lines and Steel Plant Equipment. In about 4 decades, we have successfully commissioned innumerable projects both in India and abroad. Our major markets are Australia/ New Zealand, Indian Sub-Continent, Caribbean, East/ Middle Africa, North Africa, South/ West Africa, East Europe, East Asia, Central America, Middle East, South America, South/ West Europe, South East Asia and North America. With a turnover of about US$ 1-10 Million, we have successfully established ourselves as one of the leaders in the field of manufacturing and exporting of products falling in our domain. The categories of products we deal in are Hot Rolling Mills, Cold Rolling Mills, Coilers, Wire Rod Block Mills, TMT Quenching Boxes, High-Speed Delivery Systems, Hot Saws, Automatic Cooling Beds, Cut to Length Lines, Rolling Mill Auxiliaries, Roll Forming Lines, Tube Mills, Slitting Lines, Gear Boxes, Roller Guide Boxes, Shearing Machines, Re-Bar/ Merchant Bar/ Light Structural Mills and Rolling Mill Automation. Our products are designed and manufactured by highly trained and skilled professionals who make sure that all our products are sturdy and durable. We also ensure that our produce matches the specifications to cater all the requirements of our highly reputed clients. Also, to ensure that our clients get maximum satisfaction from our produce, we manufacture our products using raw materials of the best quality and purchase them from trusted vendors. At every level of production, we also check our products for their quality and frame solutions to minimize all chances of errors. We also make use of the best and latest technology in the process of manufacture of our products and ensure that we stand at par with the latest industry standards. Manufacturing, Trading, Importer and Exporter of Hot Rolling Mills, Cold Rolling Mills, Coilers etc. Heavy / Medium / Light Section Rolling Mills, Slab / Bloom / Merchant Bar / Re-bar / Wire-bar / Rod Rolling Mills, Skelp Rolling Mills, Continuous / Tandem High Speed, Rolling Mills and Auxiliary equipment. 2-Hi / 4-HI / 6-Hi Cold Rolling Mills, Skin Pass Mills, Flattening Mills, Straightening / Leveling Machines, Stretch Leveling, Belt Wrappers and Auxilary equipment. Slitting Lines, Cut to Length Lines, Pickling Lines, De-greasing Lines, Galvanizing Lines, Colour Coating Lines, Roll Forming Lines, Sheet scalping Lines, Strip Treatment Lines and Auxiliary and secondary equipment. Tube Mills for Carbon steel / Stainless steel and other Non-ferrous metals, Reverse Loop type Horizontal Accumulators, Vertical fall type accumulators, H.F. Welders, Tube Galvanizing Plants, Hydro testers, End Facing Machines, Bundling Machines, Tube Rolls and Auxiliary equipment. Billet / Bloom / Slab Re-heating Furnaces, Walking Beam Furnaces, Rotary Hearth Furnaces, Holding Down Furnaces, Reverbatory Furnaces, Metal Melting Furnaes, Bell type, Annealing Furnaces, pittype furnaces, Recuperators, Pushers, Ejectors, Burners, Combustion systems, Fuel supply systems, Electric Control Panels and Auxiliary Equipment. Award winning member with UNDP for their Energy Efficiency programme in Steel Re-Rolling Mills. With the support and extensive labour of a highly experienced and dedicated team of professionals, our concern is scaling new heights of success in the field of supplying Plant and Machineries for Steel and Metal industries. Our manufacturing units are equipped with most modern equipment to produce state of the art technologies and our skilled team is poised to ensure quality at every step of production. It''''s the sole responsibility of our research and development team to innovate new technologies well ahead of their time. 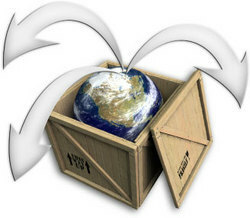 Besides this our organization is committed to cater all urgent and bulk requirements in time.